FLIR Systems, Inc. (NASDAQ: FLIR) is proud to announce the introduction of the FLIR A6700sc, the company’s newest science-grade mid-wave infrared camera that redefines affordable high performance. Featuring a highly sensitive 640×512 pixel resolution thermal detector, the A6700sc produces exceptional temperature-calibrated IR imagery for demanding research and science applications. Designed for electronics inspections, medical thermography, manufacturing monitoring, and non-destructive testing, the camera is ideal for high-speed thermal events and fast-moving targets. Short exposure times allow users to freeze motion and achieve accurate temperature measurements. The camera’s image output can be windowed to increase frame rates to 480 frames per second to accurately characterize even higher speed thermal events, helping ensure critical data doesn’t get missed during testing. A6700sc cameras stream temperature-calibrated data over Gigabit Ethernet to a PC for live image viewing and recording. 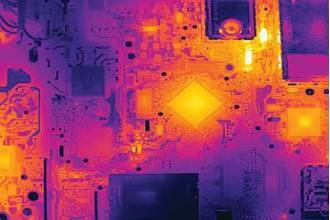 Using FLIR’s ResearchIR software, researchers and scientists can easily monitor, acquire, analyze, and share data. The A6700sc is perfect for imaging small thermal targets as well. With extender rings, users can achieve a multitude of zoomed-in fields of view, imaging the entire part with the standard lens and then zoom in on any hot spots for further investigation. In addition, A6700sc close-up lenses can detect spot sizes down to 15um per pixel, which is well beyond the capabilities that lower performance IR cameras are able to achieve. At only 7.7” x 4” x 4” and weighing 5 pounds (without lens), the A6700sc MWIR camera is easy to mount in tight locations or in situations requiring light payloads. Priced under $50,000, the A6700sc offers an exciting combination of compact profile, sensitivity, high-speed performance, and affordability. For more information, visit www.flir.com/A6700sc.